Riley a 28 pound Cocker Mix is wearing the Wrap Around Neoprene small/medium in navy blue on a 1" inch collar. Soft and secure. 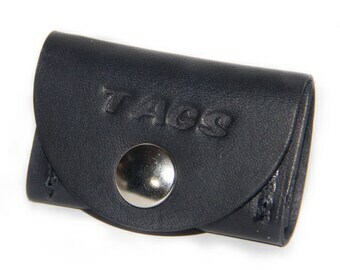 Leather Wrap Around Pet Tag Silencers offers the highest quality and construction. Chonchis wanted his name custom stamped on his l, so what Chonchis wants he gets! Camo wrap around pet tag silencer. Chonchis the Bulldog likes his! Chonchis a male Bulldog is loving his new leather pet Tag Silencer with custom stamping. Riley can't wait to get to the dog park. His is wearing the wrap around leather silencer. As you see it looks great and keeps his tags secure. His collar is 3/4" wide. You can choose up to 2" wide. Also add a custom stamping to make it really stand out.